Castillo Copper (ASX:CCZ) has today reported highly promising diamond drill core assay results for drill-hole CC0036D, which validate the high-grade nature of the underlying ore body at the ASX small cap’s Cangai Copper Mine. The best intersection, from 9.6m of highly mineralised core extracted, was 4.37m at 5.06% copper, 2.56% zinc and 22.7 g/t silver from 49.9m. Notably, within this section, the best readings were up to 14.45% copper, 5.93% zinc & 40.1g/t silver (results are still pending for gold). Diamond drill core samples 1 & 2. Castillo chairman, Peter Meagher, said: “The assay results from the diamond drill core significantly exceeded the board’s expectations, especially the 14.45% copper reading. “Clearly, in the board’s view, Cangai Copper Mine is one of the highest grading copper deposits across Australia. 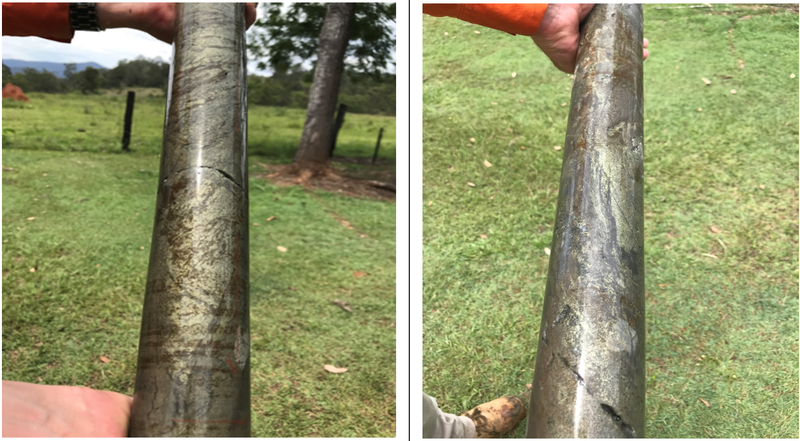 Encouragingly, these diamond core results build on the RC drilling assays from drill-hole CC0023R, which delivered 11m at 5.94% copper, 2.45% zinc & 19.1 g/t silver from 40m including 1m at 10.25% copper, 1.68% zinc & 32.5 g/t silver from 48m. From the board’s perspective, a look at these results combined indicates that the Cangai Copper Mine could have one of the highest grading copper deposits in Australia. 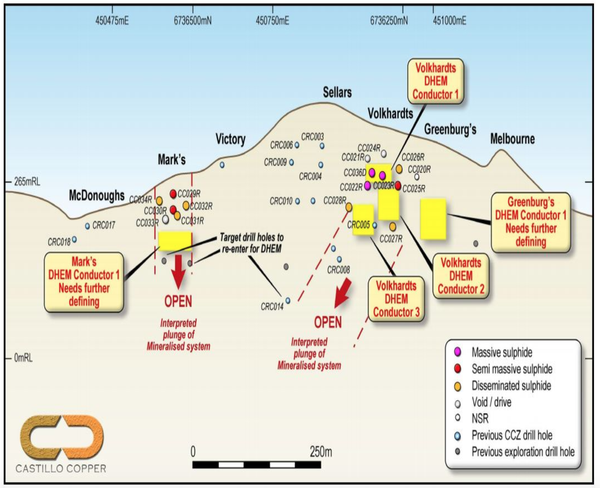 In light of the results, CCZ’s board has now mapped out its near-term exploration plans. The immediate priority for the small cap now will be to complete the phase II campaign testing DHEM conductors identified under the Mark’s, Greenberg’s and Volkhardts lodes to determine any potential extensions to known massive sulphide mineralisation. CCZ’s massive sulphide DHEM conductors at Cangai copper mine. Furthermore, the company will conduct additional DHEM surveys to identify new targets that expand the known orebody to demonstrate scalability at Cangai Copper Mine. Compared with other regions, minimal exploration, especially utilising advanced technology, has been undertaken across CCZ’s ground since the early 1990s. Previous desktop work by the geology team confirms the region is largely under-explored but is highly prospective for copper-zinc-cobalt mineralisation. Last month, CCZ updated the market on its arrangements with Noble Group (SGX:CGP) to progress metallurgical test-work on all legacy stockpiles at Cangai. As part of its agreement with Noble, CCZ’s geology team has collected samples from the stockpiles around the Cangai Copper Mine and the old smelter. The samples have been sent to a specialist metallurgical group offshore for third party verification and optimisation. Metallurgical test-work done on samples from McDonoughs’ stockpile demonstrated copper concentrate recoveries of >80%, with grades up to 22%.